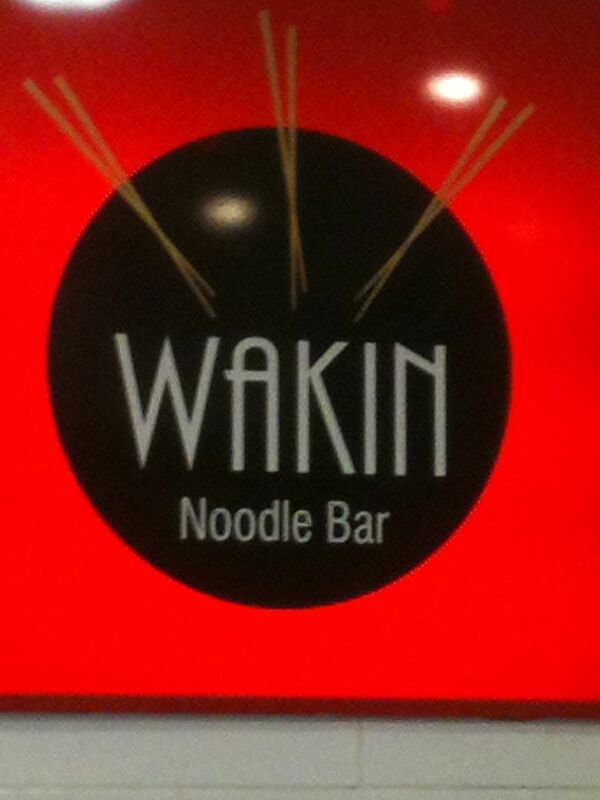 This place has two names: the Wok Inn and Wakin. Maybe somebody can explain why this might be. I haven’t a clue. It doesn’t seem to have a website but here’s the yelp.ie entry for it: Wok Inn. 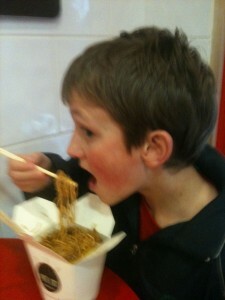 Anyway, the young lad (being on a mid-term break) and I were in town doing other stuff and we decided to give it a go. It’s on Upper Stephen’s Street, near the Drury Street junction and opposite a hotel (the Drury Court Hotel) that, until 1.45pm today, I didn’t know existed. The Wakin/Wok Inn doesn’t quite fit my self-imposed eatforafiver criteria in that it doesn’t have seats, but it does have a table (just one) that you can lean on while eating, so that’ll have to do. It’s small, clean and bright and service was both friendly and quick. 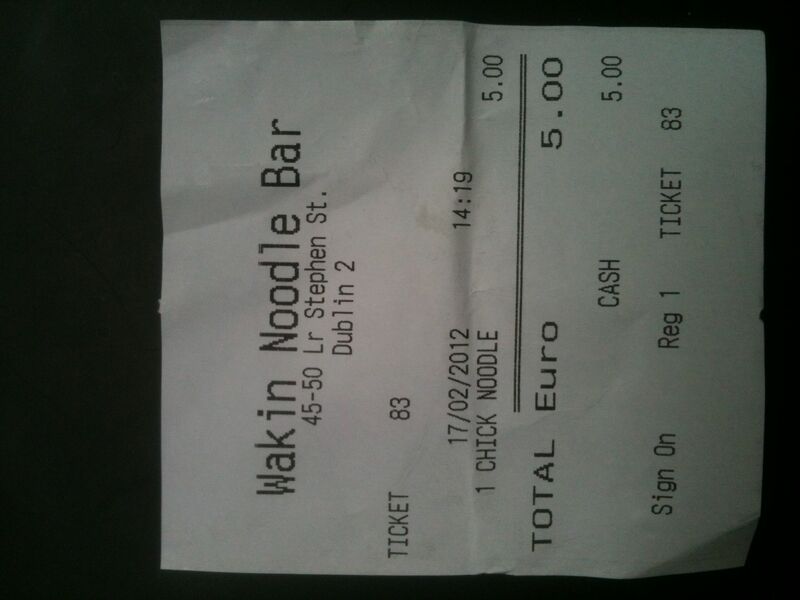 There’s quite a choice for a fiver or thereabouts: noodles, mostly, with beef, chicken or vegetables, and also curry and rice. Snacks (such as satay sticks) are a little less. Neither of us was that hungry so we ordered a portion of chicken noodles between us. 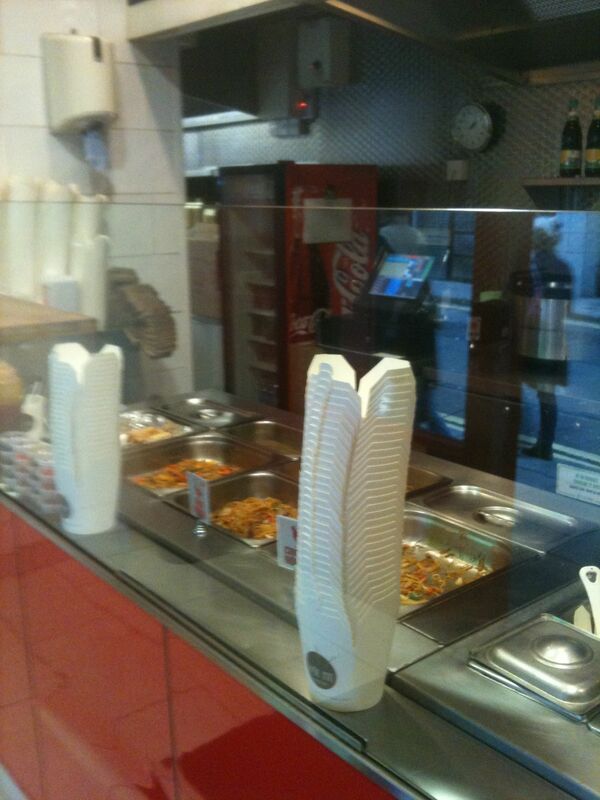 The noodles were spooned into one of those nice takeaway boxes and we were asked did we want some sauce with it. 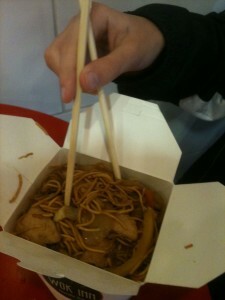 The choice seemed to be between soy sauce, sweet chilli sauce and what looked like a sambal. We passed on the sauce, paid, grabbed a couple of disposable chopstick sets and settled at the table. This was a very generous portion consisting of thin noodles, chopped peppers (yellow, green and red), onion (lots), pak choi (not much), broccoli (one piece) and chicken (real chicken, not formed, reformed, pressed or reconstituted). 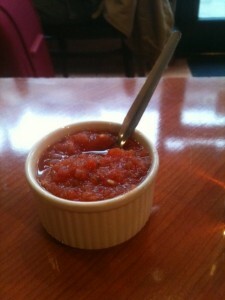 The sauce was soy based, a little overpowering and a little too sweet for my taste. The young lad thought it was good. I liked it but I would have preferred a less sweet sauce, or maybe another constituent to the sauce to make it a bit more interesting. We couldn’t finish it – and that was the two of us (admittedly not that hungry) with one portion. But even if I was hungry, I’m not sure that I could have eaten a whole portion. It was HUGE. The place was busy. I’m not sure what time it opens until but if it’s open late, I’d say it does a roaring trade when Break for the Border disgorges its clients. 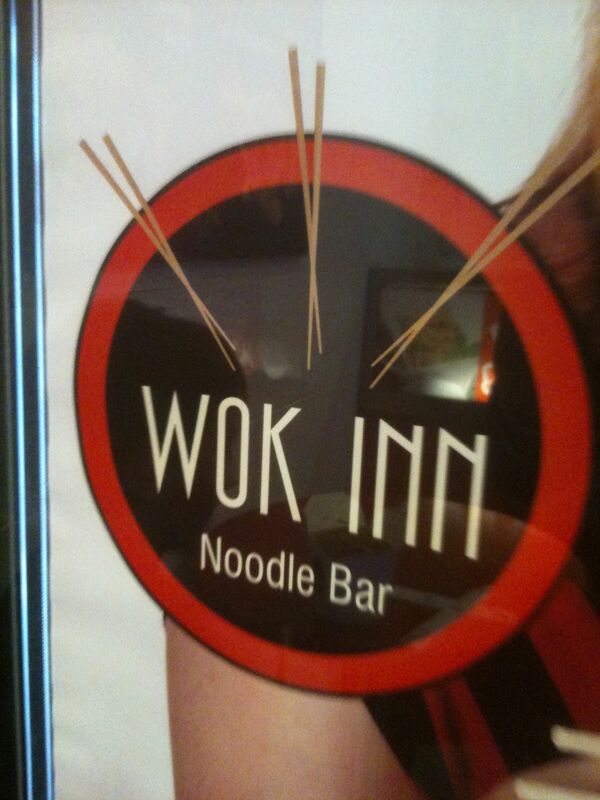 I’m going to go back, hungry, and try the curry. 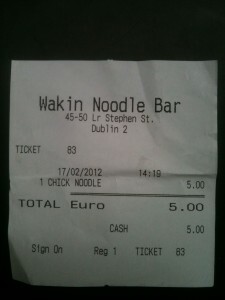 Oh yeah: that's €2.50 each! I’m not saying I did and I’m not saying I didn’t. And this isn’t a review, either. 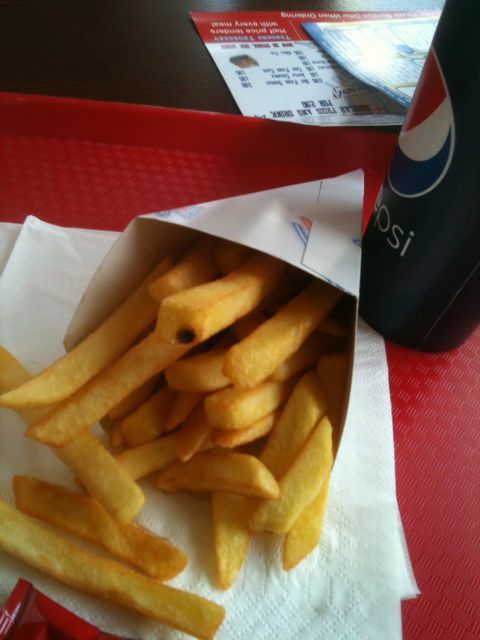 Just that Burger King has enhanced its €4.99 offer. 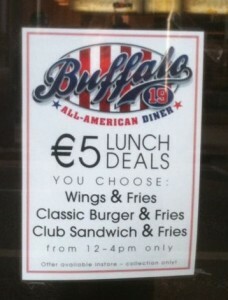 They now have a King of the Day Meal deal for €4.99, with a different style burger for each day of the week. And a bigger bag of fries (maybe – it’s hard to judge). They’ve also matched the McDonalds 2 for a tenner meal deal, with either a Whopper or a Chicken Royale as the burger element. If BK is your thing, go for it. This should not be taken as evidence of weakness. Who am I kidding? So, over two hours after my lunch today and my mouth is still tingling. The venue today was Cafe Azteca on Lord Edward Street. 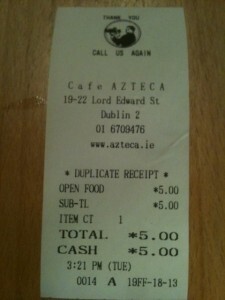 Cafe Azteca has been there since 1999! That’s thirteen years. I would have thought that that’s a long time for what is a very small restaurant. It must say something for the quality of the place. 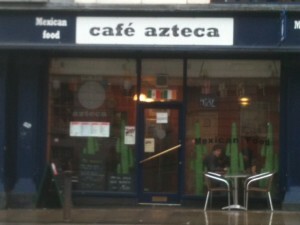 Cafe Azteca is a family run restaurant. The man behind the counter who I spoke to came originally from Mexico City and the website suggests that he’s also worked in France. It’s small (seats 18-20) and pretty unassuming from outside. Inside, it’s quite brown. For some reason it doesn’t look all that inviting and I can’t quite work out why. It could be the plastic cactus plants in the window or tinsel-y decorations hanging from the ceiling. 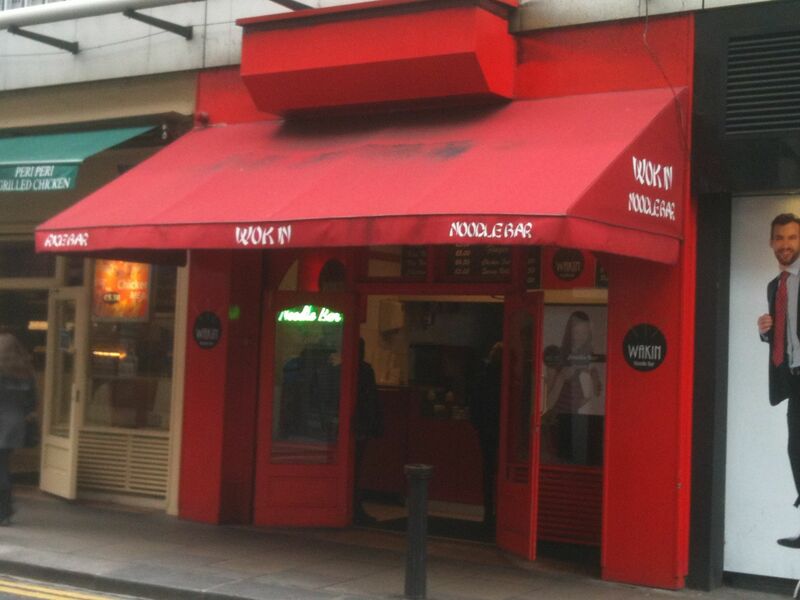 I’ve walked past it dozens of times in the last few years and, until I saw the small ‘Special Offer: Beef Burrito: €5’ sign, I wouldn’t have thought about eating there. I ordered my beef burrito (actually, on their Facebook page, the offer covers any of their regular burritos) and took a seat. 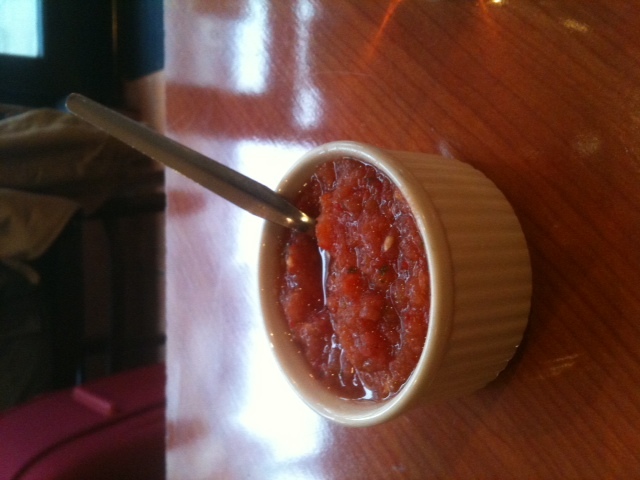 I was brought a glass of water and a small ramekin of FRESH salsa. There were 5 other diners there at lunchtime – a couple and three men, each eating on their own. My only other burrito experience being Burritos and Blues, where the burrito is made before your eyes and comes quickly, I wasn’t expecting much of a wait. This isn’t a fast food restaurant however, and the wait wasn’t unreasonable and, indeed, was worth it. Now that’s pretty good, don’t you think? I was quite hungry and tucked in. I’ve said before that I’m not an expert on Mexican food. What I’ve eaten in the past in Mexican restaurants I’ve liked but I have no idea how authentic the food has been. 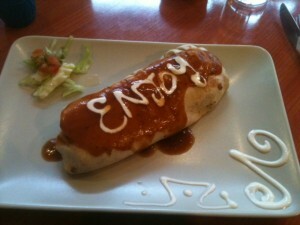 I enjoyed this burrito a lot. The tortilla wrap was substantial and inside there was a piping hot filling comprising rice, corn, beans, herbs and small strips of beef. Not mince. Real beef. The salsa was an appropriate accompaniment: its fresh tasting heat cut through the (pleasant) starchiness of the burrito and left the aforementioned tingle on the tongue. The burrito was substantial enough for a filling midday meal. 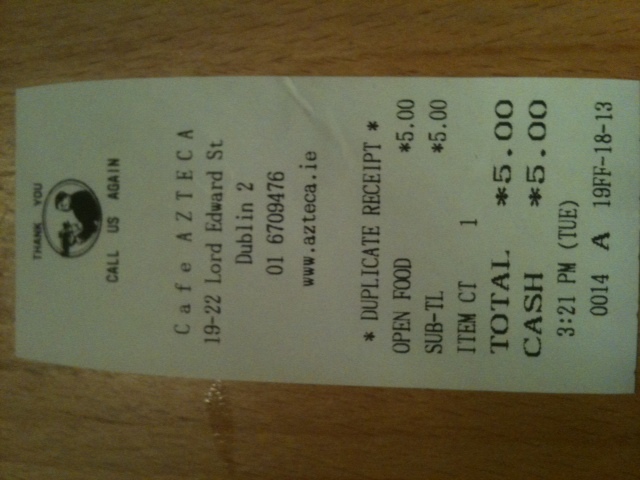 Cafe Azteca has a pretty comprehensive and varied menu and, to my eye, offers excellent value, with most main course items priced between €9.50 and €13.50. It’s not just a restaurant either. They also provide Mexican cookery courses (see their website and Facebook page for more details). Good value. Interesting place. I’ll go again and I’d recommend that you give it a go. Forgot to say: Santana was on the sound system. Appropriate. Just looked up Buffalo Wings on Wikipedia because I wondered why they were called ‘Buffalo’. 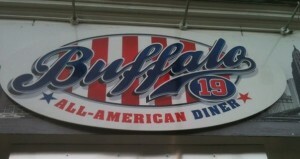 Turns out that the dish was created in Buffalo, New York. And the other thing I didn’t know was that the two parts of the wing have names: drumette and flat. I normally separate the two when I cook them and the only place I’ve been in that doesn’t separate them is Crackbird (which has just re-opened in the old ‘Fans’ premises on Dame Street, by the way). 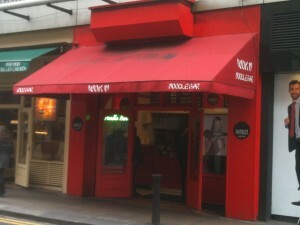 The best wings in Dublin (in my opinion anyway) WERE to be found in the Elephant and Castle in Temple Bar. We used to go there regularly, from the time it first opened in 1989. Their wings USED to be plump, juicy and HOT, served with a delicious blue cheese sauce and a few celery sticks. And there were loads of them. 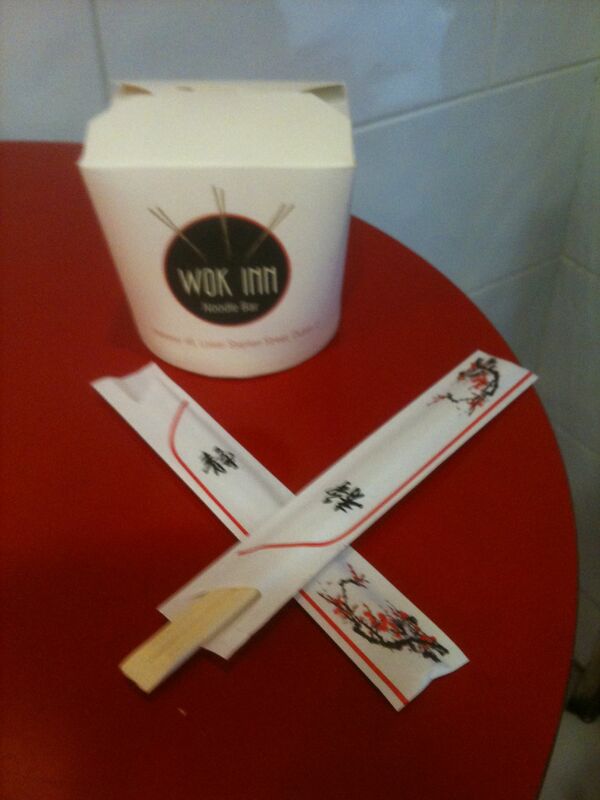 Last time we went, the wings were very disappointing. When we remarked on their general scrawniness and less-than-crispyness, the staff member very patiently (and probably not for the first time that day/week/month) explained that the food inspection people had instructed them to change the way they prepared the wings. That was that. 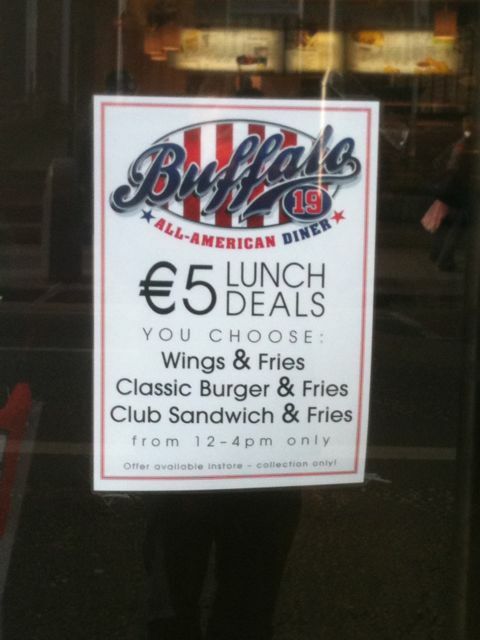 Anyway, I have my Godson Jack (a tall, blonde, handsome lad and an all round nice bloke to boot) to thank for drawing my attention to the €5 lunch deals available at Buffalo 19 in Rathmines, one of which I sampled today. 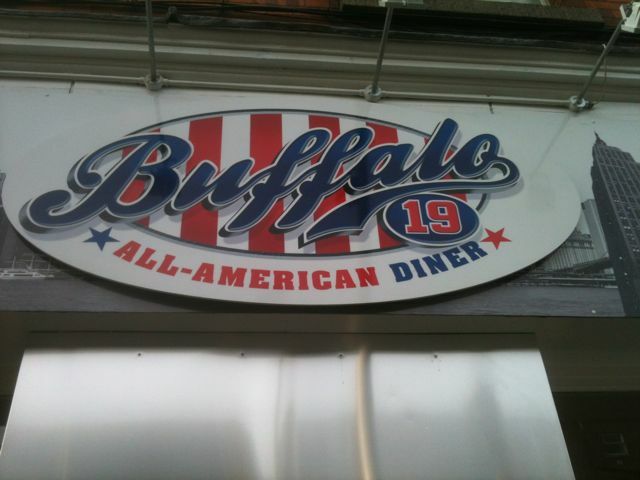 Buffalo 19 (the link is to MenuPages review page) used to be in Kenilworth, in a tiny premises that I think just did take-aways and deliveries. It’s now moved to a shiny, bigger place in Rathmines, between Tramco and St Mary’s College. My lads both used to order the occasional take-away to be delivered from the Kenilworth place. In particular, they enjoyed the hot chicken wrap and chips. I had it once and didn’t like it, I have to admit. Purely a matter of taste for me: I seem to remember that it was something to do with the sauce they put in the wrap. Back to today. I was greeted at the counter by a very pleasant smiley woman who asked me what I wanted to order. 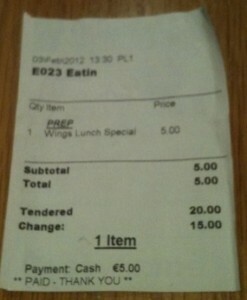 I ordered the Wings and Fries €5 Lunch Special. She reacted as if I had hit the jackpot, asking me had I ever had their wings before, saying that she didn’t want to give too much away in advance but that they were rather good. I paid, was given an order number and the tap water that I asked for. Thoughtfully, they turned the music down when calling out my number. When I collected my tray, another staff member asked me did I want anything else – ketchup perhaps – and seemed to genuinely express the hope that I would enjoy my meal. I’m kind of labouring this a bit, but this was genuine good and pleasant service. Maybe it’s because I’m getting on a bit, but good and pleasant service makes a big difference to how I react to a place. I do understand that it can be difficult for some people who are earning very little, perhaps poorly managed and maybe working in unpleasant conditions to have to put on a pleasant face to customers. I know nothing of the conditions of workers in Buffalo 19 but they seemed to be reasonably proud of the place and their pleasant and helpful attitude would make me want to return. 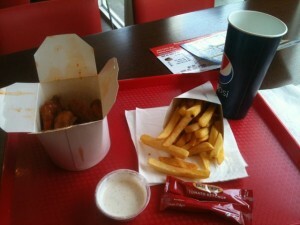 So, the food: the wings came in one of those nice American style take-away boxes that I waxed lyrical about last week. There were 14 bits, mostly ‘flats’ (hey – now that I know the technical term, I’m going to use it). They were warm, crispy, meaty enough and covered in a decent pepper sauce. The only down side was that they were quite oily – there was a substantial residue in the box when I’d finished. If they could find some way of soaking that up before serving the wings, it would be better. 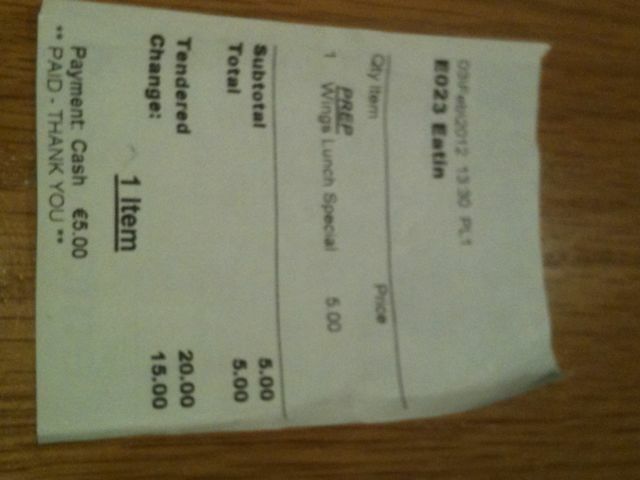 I didn’t expect 14 bits of chicken though and, with the chips, I think this represents pretty good value for a fiver. The wings come with a small tub of blue cheese sauce. The sauce is a little thin but it’s OK. The chips were pretty good too. 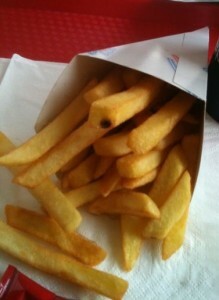 They weren’t chip shop chips and they weren’t burger joint fries either. They were thinner than the former and thicker than the latter. They tasted spuddy, they weren’t greasy and I liked them. The other items on offer for a fiver, as you’ll see from the photo, were a classic burger and chips and a club sandwich and chips. I was tempted by the club sandwich and maybe I’ll try that next time I go. I do love wings though. The lunch deals are available from 12 – 4pm. As I said, I think this is pretty good value. The food was tasty and it was a generous serving. Not very heart-healthy but, you know, whatever. I don’t normally do this but I can’t think of any good reason not to. 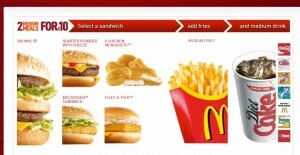 Anyway, McDonalds is doing an offer at the moment: 2 Medium Meals for €10. That, as my old maths teacher Miss Williams would have pointed out, is a fiver each.